New collaborative research published online on September 12, 2014 in an open-access article in the journal Nature Communications by scientists from Japan, Russia, and the United States contains the genetic analysis of a species of African midge, which can survive a wide array of extreme conditions, including large variations in temperature, extreme drought, and even airless vacuums such as space. The team successfully deciphered the genetic mechanism that makes the midge invulnerable to these harsh conditions. Professor Noriyuki Satoh and Dr. Takeshi Kawashima of Professor Satoh’s Marine Genomics Unit, as well as Professor Alexander Mikeyhev of the Ecology and Evolution Unit, and Mr. Manabu Fujie and Dr. Ryo Koyanagi of the DNA Sequencing Section at the Okinawa Institute of Science and Technology Graduate University have contributed to the collaboration. 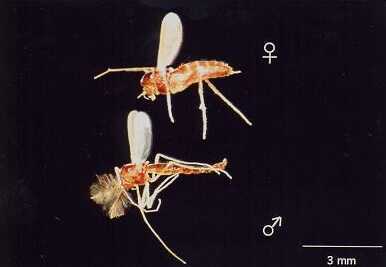 The midge, Polypedilum vanderplanki (image), is capable of anhydrobiosis, a unique state that allows an organism to survive even after losing 97% of its body water. Anhydrobiotic organisms are also able to survive other severe conditions such as extreme temperatures ranging from 90°C to -270°C, vacuums, and high doses of radiation; all of which would be lethal to most other life forms. The midge found in northern Nigeria lives in an environment where the dry season lasts for at least six months and droughts can last up to eight months. By the time eggs have hatched and larvae have developed, the pools of water they breed in have dried up. However, these dried larvae can survive in this dehydrated state for more than 17 years. “This is a very interesting kind of phenomena,” remarks Professor Satoh. 65 million people around the world today suffer from epilepsy, a condition of the brain that may trigger an uncontrollable seizure at any time, often for no known reason. A seizure is a disruption of the electrical communication between neurons, and someone is said to have epilepsy if they experience two or more unprovoked seizures separated by at least 24 hours. Epilepsy is the most common chronic disease in pediatric neurology, with approximately 0.5-1% of children developing epilepsy during their lifetime. A further 30-40% of epileptic children develop refractory epilepsy, a particular type of epilepsy that cannot be managed by antiepileptic drugs (AED). Regardless of etiology, children with refractory epilepsy are invariably exposed to a variety of physical, psychological, and social morbidities. Patients whose seizures are difficult to control could benefit from non-pharmacological therapies, including surgery, deep brain stimulation, and ketogenic diets. Therefore, the early identification of patients whose seizures are refractory to AED would allow them to receive alternative therapies at an appropriate time. Despite idiopathic etiology being a significant predictor of a lower risk of refractory epilepsy, a subset of patients with idiopathic epilepsy might still be refractory to medical treatment. Using a new electroencephalography (EEG) analytical method, a team of medical doctors and scientists in Taiwan has successfully developed a tool to detect certain EEG features often present in children with idiopathic epilepsy. The team developed an efficient, automated, and quantitative approach towards the early prediction of refractory idiopathic epilepsy based on EEG classification analysis. EEG analysis is widely employed to investigate brain disorders and to study brain electrical activity. Regenerative medicine researchers at Wake Forest Baptist Medical Center have addressed a major challenge in the quest to build replacement kidneys in the lab. Working with human-sized pig kidneys, the scientists developed the most successful method to date to keep blood vessels in the new organs open and flowing with blood. The work was reported online on September 3, 2014 in the journal TECHNOLOGY. "Until now, lab-built kidneys have been rodent-sized and have functioned for only one or two hours after transplantation because blood clots developed," said Anthony Atala, M.D., director and professor at the Wake Forest Institute for Regenerative Medicine and a senior author of the study. "In our proof-of-concept study, the vessels in a human-sized pig kidney remained open during a four-hour testing period. We are now conducting a longer-term study to determine how long flow can be maintained." If proven successful, the new method to more effectively coat the vessels with cells (endothelial) that keep blood flowing smoothly, could potentially be applied to other complex organs that scientists are working to engineer, including the liver and pancreas. The current research is part of a long-term project to use pig kidneys to make support structures known as "scaffolds" that could potentially be used to build replacement kidneys for human patients with end-stage renal disease. Scientists first remove all animal cells from the organ - leaving only the organ structure or "skeleton." A patient's own cells would then be placed in the scaffold, making an organ that the patient theoretically would not reject. The cell removal process leaves behind an intact network of blood vessels that can potentially supply the new organ with oxygen. We often experience difficulties in identifying the accurate shape of dynamic and fluctuating objects. This is especially the case in the nanoscale world of biomolecules. The research group lead by Professor Koichi Kato of the Institute for Molecular Science, National Institutes of Natural Sciences, has developed a methodology for quantitatively describing the dynamic behaviors of complicated sugar chains in solution at atomic resolution by combining a sophisticated NMR spectroscopic approach with an ingenious molecular dynamics simulation technique. This study was published online on September 4, 2014 in Angewandte Chemie International Edition, a scientific journal that is published on behalf of the German Chemical Society. The sugar chains are flexible accessories decorating the surface of proteins. These variable accessories actually mediate protein-protein communication and even determine the fates of the protein. In other words, the sugar chains serve as transformable "code" that governs the protein's action in our body. For example, it has been revealed that particular sugar chains modifying lipids on cell surfaces offer acceptor sites for viral infections and trigger conformational changes of proteins involved in neurodegenerative disorders including Alzheimer's disease. Hence, decoding the sugar codes is desired not only for better understanding the molecular mechanisms behind a variety of biological processes, but also for designing new drugs targeting these processes. However, conformational characterization of the sugar chains has been hampered by their dynamic properties. Many experimentalists and theorists have taken on the challenge to solve this problem.